Coordinated by DANM student & 3D Prototyping Lab coordinator, Gene Felice. Featuring selections from his personal collection of animation compiled while teaching 3D modeling & animation and running the 3D prototyping lab at the Ohio State University and throughout his life as a lover of all things animated. 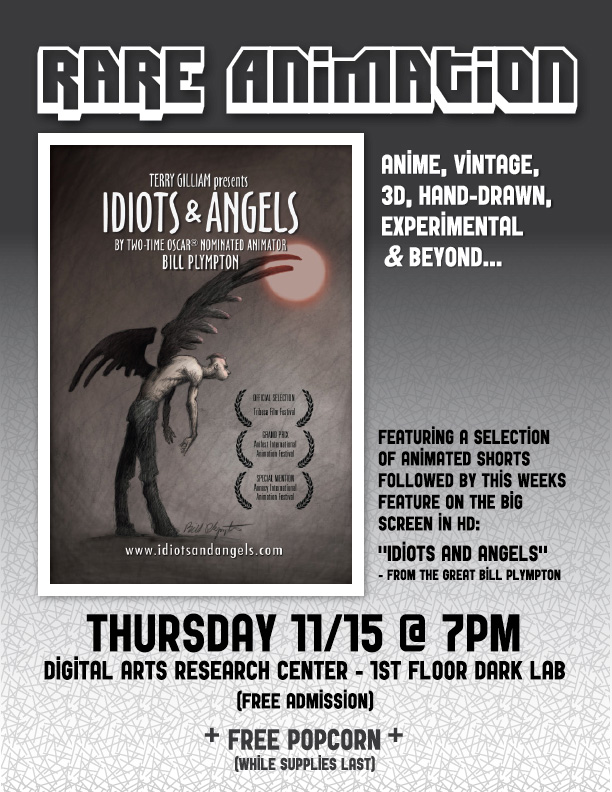 Each month, a selection of animated shorts will be followed by an animated feature film, on the DARK Lab's state of the art HD projection and surround sound system in the Digital Arts Research Center. Bill Plympton's "Idiots & Angels" which was produced by Terry Gilliam and features the incredible grunting abilities of Tom Waits.